Another nice day in the Manawatu - the winter weather is still holding off quite nicely so no excuse not to get out on the bike. Today was just a quick squirt over the Pahiatua track, through to Mangamire, back over the track and through to Balance. From Balance I headed over the Saddle where I passed a guy on a CB1300 and then had another couple of guys (Firestorm & Bandit) pull out in front of me when they turned out of the windmill lookout. I passed them and then headed on down into Ashurst before heading out towards Pohangina and crossing over to Colyton, Fielding and Halcombe. Coming back towards Fielding from Halcombe the same two guys went past going the other way - they must have stopped somewhere for a coffee as I'd probably covered a fair bit more ground than them. Anyway nice to see quite a few bikes out on the road enjoying the sunshine. Fun little ride of about 170km all up. A New Plymouth Traffic Patrol Cop was watching for speeders with amobile radar gun, but wasn't getting many. Then he discovered the problem.A 12-year-old boy was standing up the road with a hand painted sign, which read "RADAR TRAP AHEAD". The officer then found a young accomplice down the road with a sign reading "TIPS" and a bucket full of money (and we used to just sell lemonade)? A motorist was mailed a picture of his car speeding through a pole mounted Speed camera in Otago with a fine of $160 included. Being cute, he sent the police department a picture of $160. The police responded with another mailed photo of handcuffs. A young woman was pulled over for speeding. As a Central Otago Cop walked to her car window, flipping open his ticket book, she said, "I bet you are going to sell me a ticket to the Central Otago Police Ball". He replied, "Central Otago Police don't have balls." There was a moment of silence while she smiled, and he realised what he's just said. He then closed his book, got back in his patrol car and left. She was laughing too hard to start her car. I guess if you've visited this blog before you'll notice that I've had a bit of a tidy up of the header etc. I've also made a few changes to my website: a new front page and slideshows on most of the major ride reports showing pictures from those rides. Hope you'll check it out and like the changes. 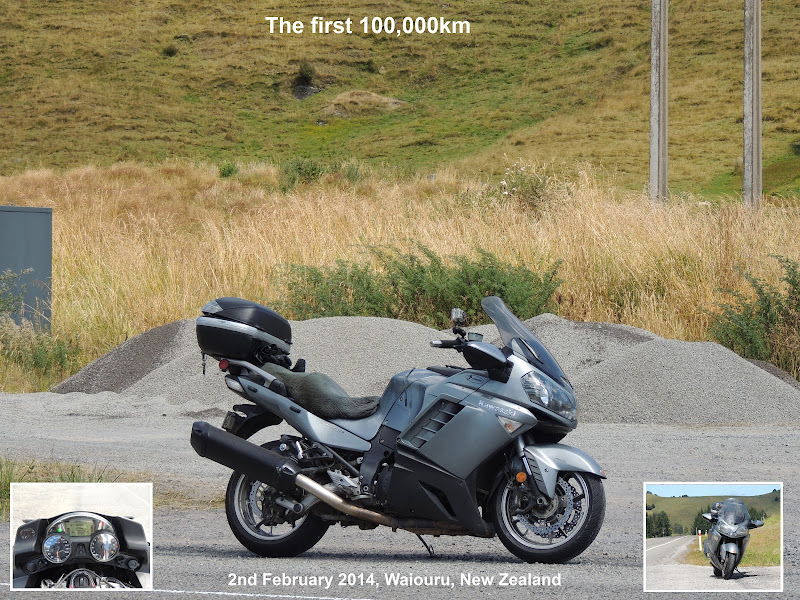 Great ride number one: Te Anau to Milford Sound, 240km return. The reason that this ride rates as a great ride is simple: it combines absolutely stunning scenery with a great road. It doesn’t even matter that the road is a dead end and you have to turn around and ride it back – this just gives you a double dose of motorcycling heaven. As this ride is in the Fiordland in the deep south-west of the South Island the weather definitely needs to be considered when tackling this ride. It would definitely be no good in the winter and the road is generally closed by snow a few times each winter. It also on the tourist route with a huge number of buses and campers using the road to get to Milford Sound and the boat cruises based there – you need to be patient with these guys, there’s not much room to pass in some places. I’ve now ridden this twice and have been very lucky with the weather. 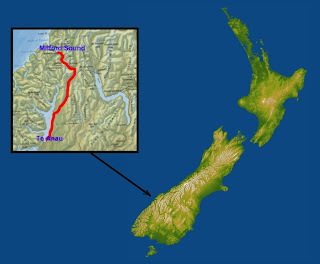 On the first occasion I had ridden through from Invercargill to Te Anau, obtained some accommodation, dumped some gear and then took off to Milford in the afternoon. I then took one of the boat cruises to take in the beauty of the Sound and then raced back to Te Anau by 5:30pm or so. Not long after that it started raining and didn’t stop until I reached Queenstown the next day – glad I was not staying in a tent as some were. The second time I went into Milford was in late April and we left Te Anau pretty early in the morning and got to Milford Sound by around 10am. It was quite cold all the way there was snow within 400m of the road in a couple of places. Perhaps ice would have been a concern if we had left any earlier in the morning. It did make for a beautiful, clear and sunny day – great for photography. And now for the ride itself: leaving Te Anau you initially pass through some open tussock c ountry with Lake Te Anau to your left and hills to your right. After a while you enter a more winding road which is surrounded by a beautiful beech forest – this looked truly spectacular in April with all the leaves having changed colour. There are a number of spots to stop along the way and there are tramping tracks leading off into the hills everywhere. When you come out of the forest you find yourself in a huge valley carved out of the mountains. Picture it: a wide open valley with a river running through it and mountains surrounding it on both sides – remember to keep your eyes on the road. The road crosses the river and starts winding up a hill. Once again you are in a forested area with the river on your right and at one stage you cross a bridge with a waterfall tumbling down on your left. Now you start working your way up the hill a bit more and the country opens o ut to tussock again before the entrance to Homer Tunnel. There’s plenty of room to park up here and take photos of the countryside or talk to the local kea population – don’t let them eat your bike. The Homer Tunnel (picture is from the Milford side) is one way and controlled by traffic lights and as it is 1.25km long you can be waiting a while for the light to change. The first time I went through it I was all on my lonesome (no other traffic) and it seemed quite dark in there – lights definitely required. It is also quite steep but the thing that really freaked me out was I could hear the rushing of water and I knew that the road was wet but wasn’t sure if I was going to end up hitting a great stream running across or down the road. Luckily the water was just running in a big drain at the side of the road. Once exiting the tunnel you start dropping into Milford and the road is very steep with two really sharp corners (not sure if they’re signposted as 15 or 25 km/h). You then enter another beech forest and wind your way over a couple of one lane bridges before finally arriving in Milford Sound. There’s not much there – just an airfield, cafes and the boat cruises but straight out in front of you is the famous Mitre Peak. It’s well worth it to take a cruise and see more the stunning fiords, mountains and wildlife and then you get to ride back out. Obviously the ride out is a repeat screening but you get to ride up that great road from Milford to the Homer Tunnel and then drop back down the other side. Before you know it you’re back in Te Anau. Maybe it’s just because it’s only been a few weeks since I did this ride and it’s still fresh in my mind but this ride is definitely worthy of the Great Ride tag. If you’re down south don’t miss it – you have to go out of your way to get there but you’ll be glad that you did. if there’s any at Milford. be looking at the scenery – not for bikes. Now that I'm back home from this year's big event (the Southern Cross), and it's still a fair while until the Grand Challenge (October) I thought that maybe I'd start piecing together a few write ups of some of the truly great rides I've been on. I know, every ride's a good one - what's that old saying: "The worst day's riding is better than the best day at work." But sometimes a ride can be truly "great". Whether it is the weather, the road, the scenery, the company, the bike, the challenge, the traffic conditions or whatever - it has become something better than a normal Sunday afternoon potter. Well, I've been home for a while and still haven't managed to quite get a ride write up on the net yet - but I'm working on it. Yee ha! Good to see Josh Coppins taking another couple of wins in MX1. Looks like he's gonna be the man to beat this year - about time the title came back to NZ!